This is the beginning of a series of posts you will see from time to time. As a vegetarian, there are some things that make life easier and/or more enjoyable, and “Favorite Things” is an attempt to share such things. I love me some tortillas! I love large, slightly doughy flour tortillas for burritos, and small, gritty corn tortillas for enchiladas and tacos. Good tortillas are hard to find in DC– particularly if you are trying to avoid partially hydrogenated oils (like we do in my household). The options are scarce, and they’re generally paper thin, they fall apart and are too dry. Whole Foods has some okay ones – although they tend to stick together too much and rip when I pull them out. But they at least taste decent. The local co-op has local, organic ones, but they fall apart like bad moo shoo pancakes (and taste similarly like paper). I once attempted to make flour tortillas, and while they didn’t quite taste right, they functioned beautifully. If you haven’t been able to tell, coming across quality, tasty tortillas has become somewhat of a minor (read: major) obsession of mine. And I’m proud to report that I now have a couple favorites to share! This relatively new line of tortillas presents the most unique, and probably tastiest, corn tortillas I’ve ever had! 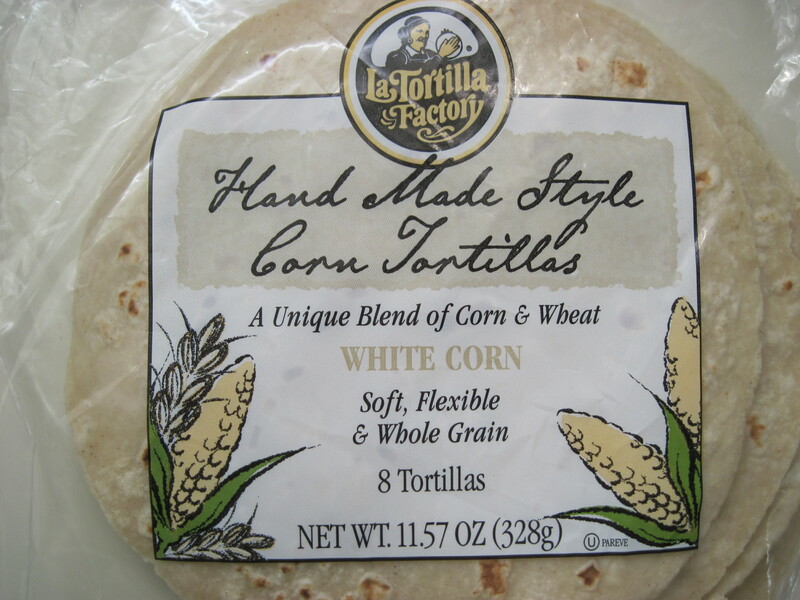 They’re not traditional corn tortillas at all, because they’re a blend of white corn and wheat. They have a slightly milder corn taste and they are moister and more flexible. They make great enchiladas, quesadillas (as they crisp nicely on the outside when pan-frying), and could be baked slowly at a low temperature for delicious, home-baked tortilla chips. Around the DC area, they can be found at some Safeways. Apparently they can also be found at some Giants, Trader Joe’s and Whole Foods. During my first trip to Pittsburgh (only a matter of months ago) I was taken to the Strip District. It’s a cute area along one of the rivers offering a great selection of specialty markets. After some breakfast and walking around, we were about to head back to the car and I spotted Reyna Foods. Because of my long-time search for good tortillas I thought, ‘let’s take a look – who knows, they might have a good selection of tortillas.’ To my dismay, their selection was not huge. However, they were full in stock of 3-4 types of homemade tortillas that I could see them making on a large contraption in the back. They looked amazing! I picked up a pack, gave it a gentle squeeze and sniffed through the plastic as I read the sign explaining that these were homemade with no preservatives and that they’d only last about 10 days. I grabbed a pack of the garlic tortillas to take home and test. On the ride back to DC from Pittsburgh I kept thinking about them, occasionally getting a whiff of the garlicky aroma. After about an hour of torture, even though I was still stuffed from breakfast, I broke down and tore open the pack. With one bite, I immediately transcended to tortilla heaven! So delicious, they were a joy to bite into. I went back 2 weeks later for work and stopped by to try the corn, flour, and chipotle varietals. They were all just as satisfying. I have to head to Pittsburgh every few months for work and will most certainly ALWAYS make time to stock up on tortillas from Reyna’s. Just a note, they did have a refrigerator containing tortillas made with preservatives that would last longer, but with me around, expiration dates on good tortillas are irrelevant – so why get the unnecessary preservatives? Check out Reyna Foods on yelp.com by visiting the link below. As you’ll see in the reviews, I’m not the only person raving about their homemade tortillas!